Who doesn’t hang with a pig by the pool? Such is my glamorous life. 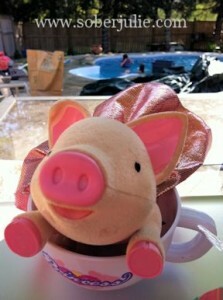 I wish I could hang with a pig by the pool! If I don’t drop 15 pounds by Summer, I’m going to look like a pig by the pool.